NATALIA SPEIRS, B.ED. (HONS), M. MUS. Natalia Speirs began her musical education at a very early age with piano and voice lessons. Her talent and passion for music was nurtured by her parents with regular visits to the theatre, ballet, opera and to hear the popular singers of the day. Since childhood, Natalia appeared on stage with a chlidren's ensemble and choirs. Her first real success was in kindergarten at the age of 5 performing as a Snowmaid (Snegurochka) and a leading role in a spectacular Christmas Show for children. Natalia still recalls the sincere, generous and long applause which followed these early performances. 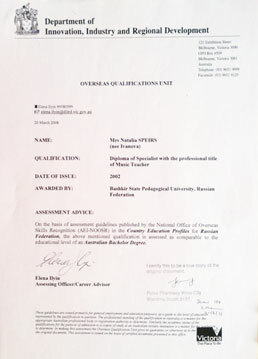 After graduating from High School in 1994, Natalia successfully completed seven grades of Music School (piano class) with Honours in the same year. Natalia was passionate about music since eady childhood. After High School and School of Music, she continued her formal music training at the Pedagogical College where she studied Classical Piano and Academic Singing. In 1999 Natalia completed a Bachelor of Music degree with Honours. In 1998 at the age of 19 years old Natalia took part in the International Photo Competition " Russian Beauties" and was invited to continue her modeling career overseas. Her photos often appearing in the popular magazine "Dvoe", "Afrodita". Natalia continued her post grad. 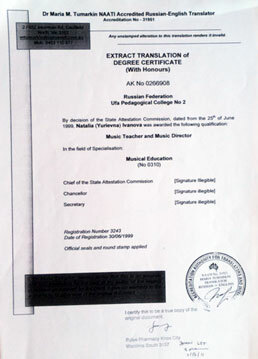 studies at the Ufa Pedagogical University specialising in piano and voice, graduating in 2002. In the some year at the age of 23, Natalia married Australian composer Cameron Speirs, migrating to Australia in December 2002. Natalia has taught and performed extensively, establishing a successful teaching practice in Melbourne. Natalia has participated in numerous song contests, Musical Festivals, Gala Concerts, and Vocal competitions. 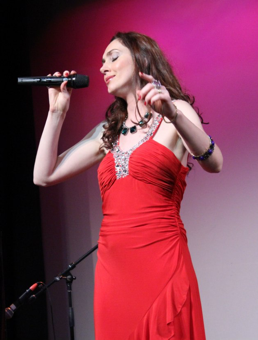 Natalia regularly performs Solo Recitals for English and Russian audiences. She recently released the album "Find me", a compilation of 19 songs completed at Move Studio in Melbourne. She is a featured artist at the Russian Film Festival, Festival "Maslenitsa", Jewish Gala Concert, Concert dedicated Victory Day and Poetry of Zvetaeva and in SBS TV documentary "People and Fates". Natalia Speirs is not only successfull in her musical career. She is a happy mother of 2 children - Daniel, born in 2009 and Alexander in 2011. Her repertoire has absorbed almost the whole range of musical styles and genres - from ballades,folk songs to classics. Audiences have been extremely positive in their reception to Natalia's performances in a range of musical settings for over a decade now. Natalia is constantly striving to improve her performances and has a number of exciting projects in preparation. Equally at home in a concert hall or serenading audiences in more intimate settings, Natalia's performance style is characterised by a natural musicality, charisma, energy and a heartfelt commitment to giving her best.